During the last few weeks our forests have gone through a dramatic change. 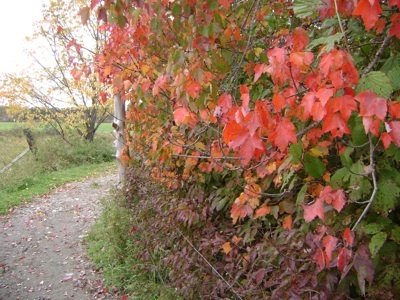 Seen from afar, that has been obvious in the changing of leaf colors and the thinning out of the leaves in the tree canopies. Walking inside the forest, these processes are reflected by the thick layer of color-full fallen leaves and surprising new views through leaf-less branches. Flowering or even just green plants on the forest floor have become a rare sight. This is the season when we tend to notice the abundance of ferns in our forests. 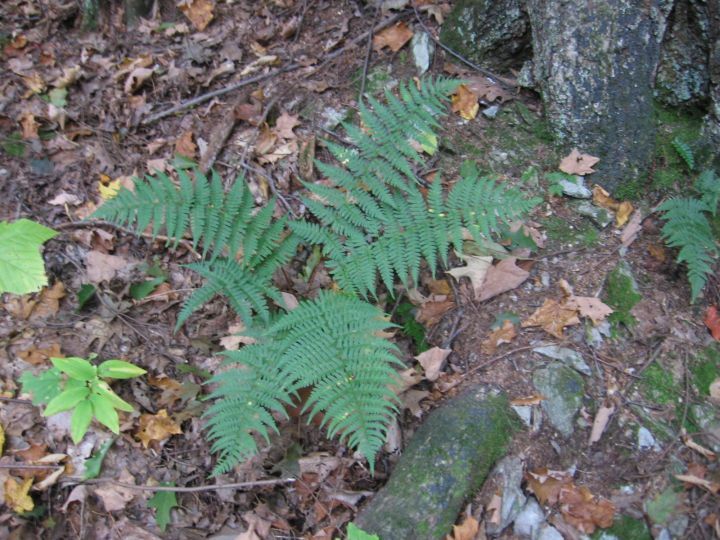 Over all, we know of 65 species of ferns and fern relatives (such as club mosses and horsetails) in Columbia County and have found around 15 of them on Phudd Hill. This little photo essay is not trying to represent all of the species that occur on Phudd Hill, but just to highlight a few that can be observed right now. We have both evergreen and deciduous ferns. 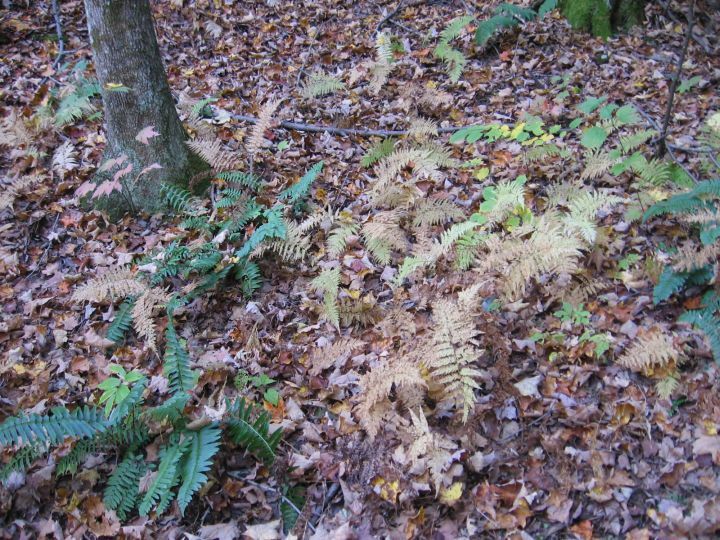 In this picture, the evergreen Christmas fern (Polystichum acrostichoides) contrasts with the withering, yellow fronds of hay-scented fern (Dennstaedtia punctilobula). Christmas fern is one of our coarser-leaved ferns, its leaflets (or “pinnae”) are not dissected, but have a characteristic assymetrical base with a little “ear” near the fronds midrib (or “rachis”). 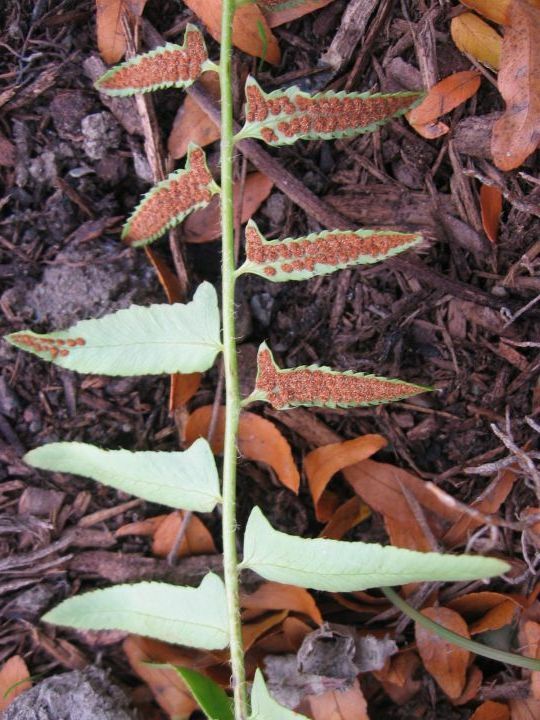 The spores of Christmas fern are formed on the underside of the leaflets at the tip of the frond and the sori (small clusters of spore-producing structures) tend to cover the entire blade of those leaflets. 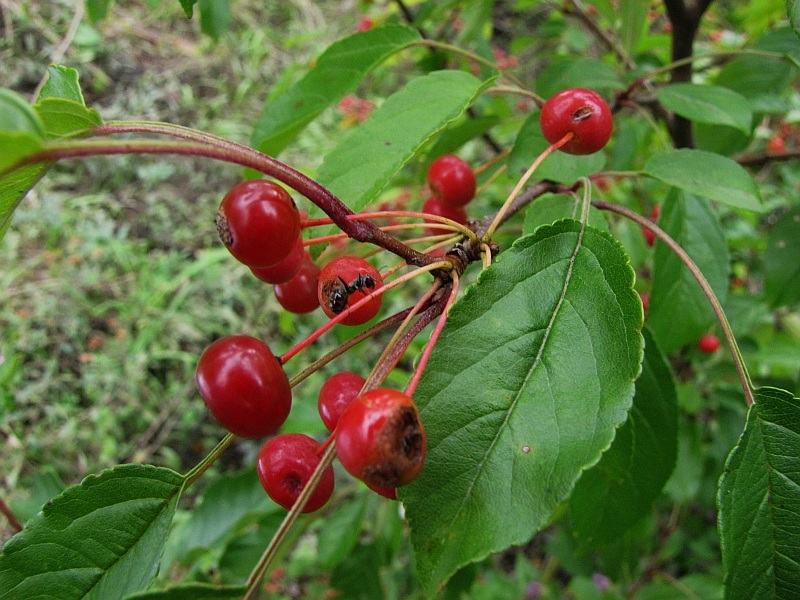 Both these close-up photos were taken in the native plant garden at the Creekhouse. 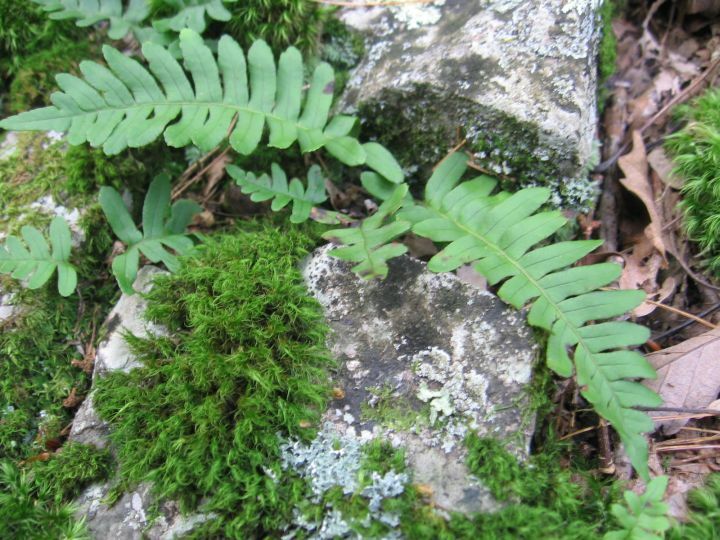 Superficially similar to the Christmas fern is another coarse-leaved evergreen fern, the common polypody (Polypodium virginianum). 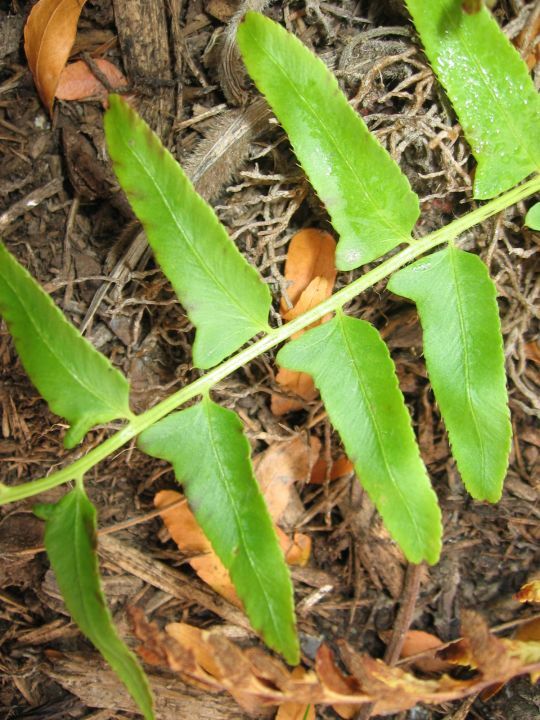 Note how the leaflets of common polypody line up seamlessly along the midrib and do not have the “ears” characteristic of Christmas fern. 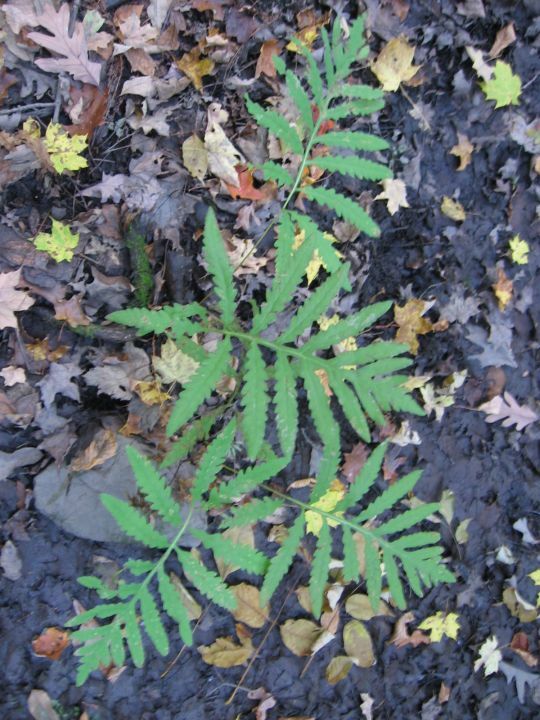 Common polypody tends to be smaller than Christmas fern and is usually only found on or near rocks or at the base of trees. 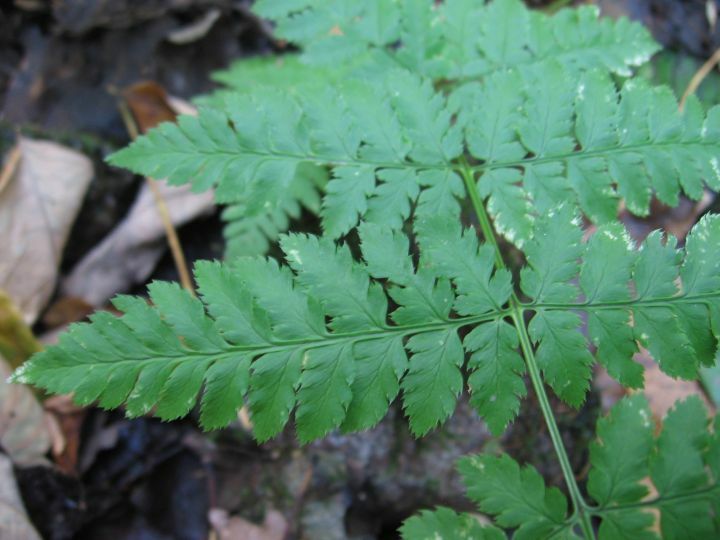 Another evergreen fern that draws our attention during this season is the marginal woodfern (Dryopteris marginalis). 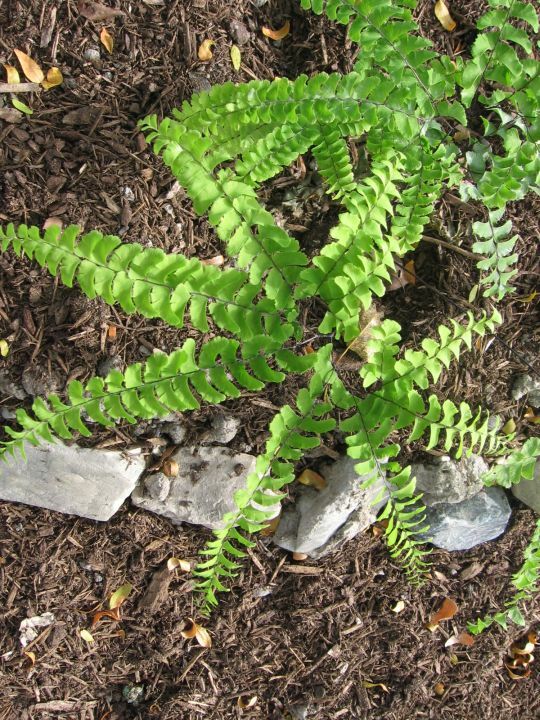 It tends to be a large fern with fronds that form orderly, vase-shaped clusters. 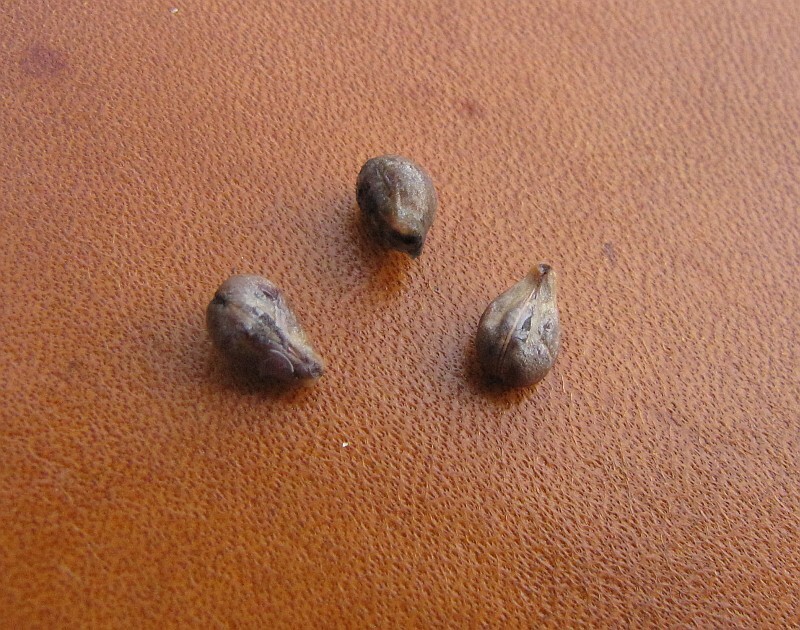 Its leaflets (or “pinnae”) are dissected into “pinnules” and the spores are produced on the underside of most leaflets. The round sori (clusters of spore-producing structures) are located very close to the margin of the pinnules, hence the name “marginal” woodfern. 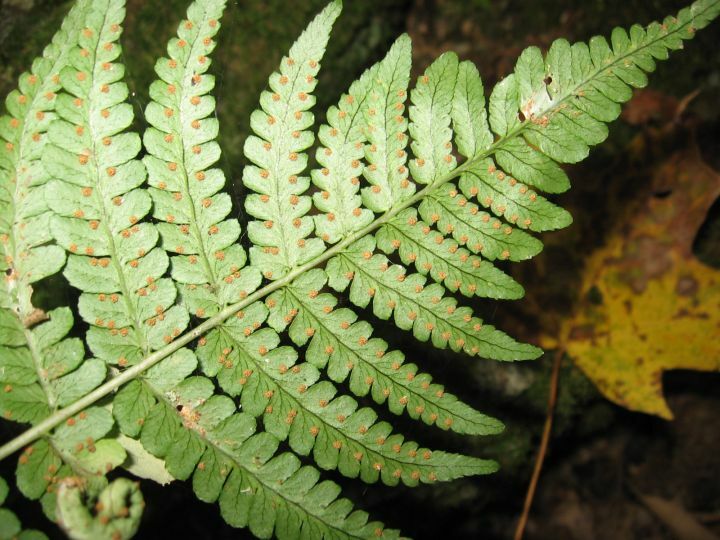 Other wood ferns (Dryopteris sp.) have more dissected leaflets, resulting in very beautiful lacy fronds. There are a number of very similar, closely related lacy wood fern species, but only the evergreen wood fern (Dryopteris intermedia or D. spinulosa) stays green throughout the winter. Sensitive fern (Onoclea sensibilis) is the first fern to wither after a good frost. This picture was taken 10 days ago. Can you still find any green sensitive ferns in frost-protected micro-habitats? Sensitive fern is a very common fern of wet meadows and swamp forests, but can also be found near vernal pools and other wet areas on Phudd Hill. In a few spots it is joined by another wetland fern, the much rarer royal fern (Osmunda regalis). 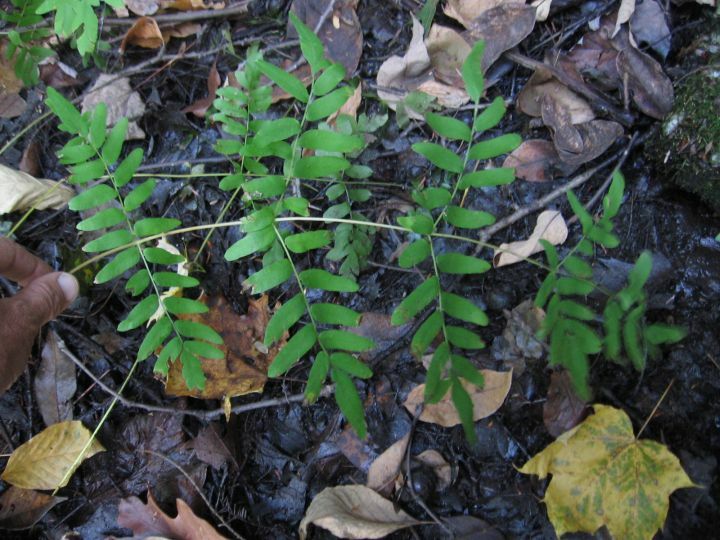 Royal fern can grow more than 3 feet tall and forms its spores at the tip of its fronds. However, no spores are visible on this photo. Finally, here comes one of my favorites, the easily recognized and beautiful maidenhair fern (Adiantum pedatum). 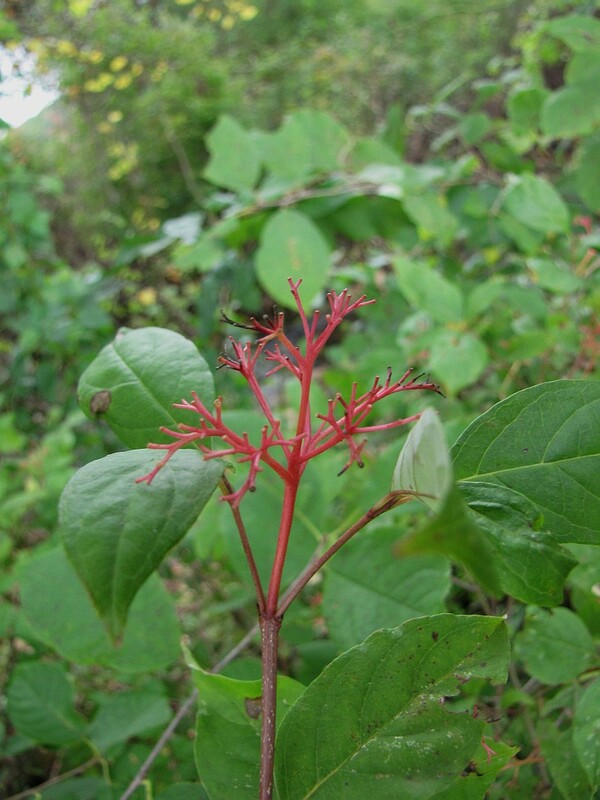 It is an uncommon plant Columbia County and likes calcium-rich soils. On Phudd Hill, we know of only one spot with a few individuals of this species. 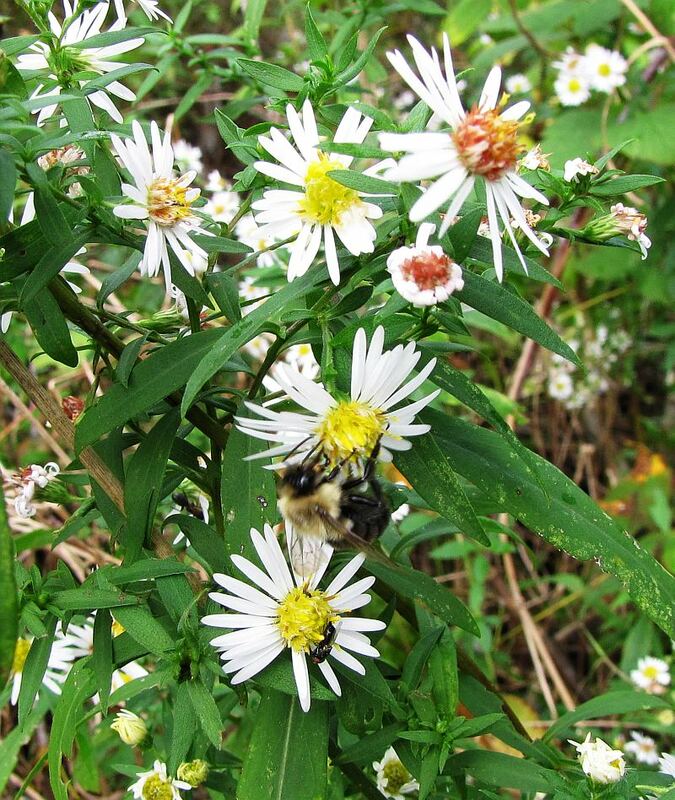 This photo was taken in the native plant garden at the Creekhouse. Maidenhair fern has thin, polished, dark purple to black stems and its exotic-looking fronds fit with the fact that it is a member of a tropical genus, with many close relatives growing in the rainforests of South America. On our way to Phudd Hill, last week, we found another member of a tropical genus stranded on a cold and windy day in the dairy field of Hawthorne Valley Farm. 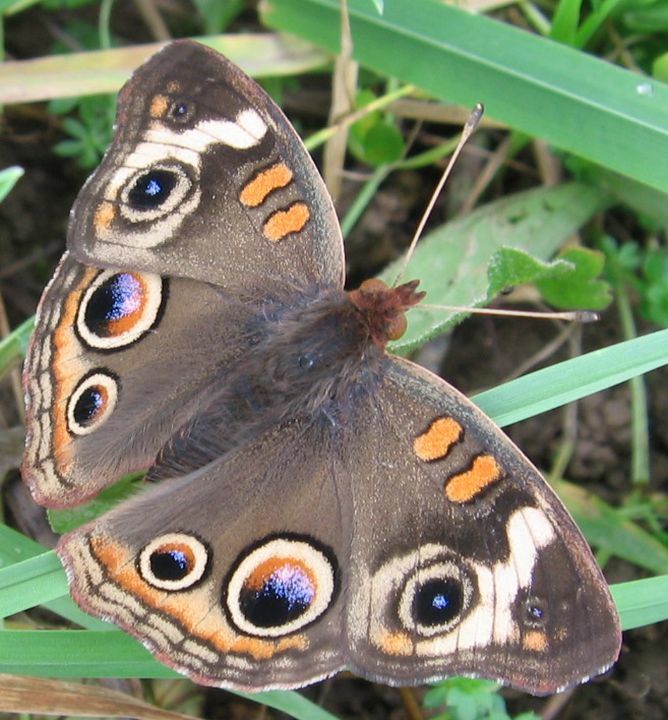 The common buckeye (Junonia coenia) is a medium-sized butterfly (wingspan: 2″) and the only member of a tropical genus that regularly migrates north. Depending on the year, they may or may not make it into Columbia County. 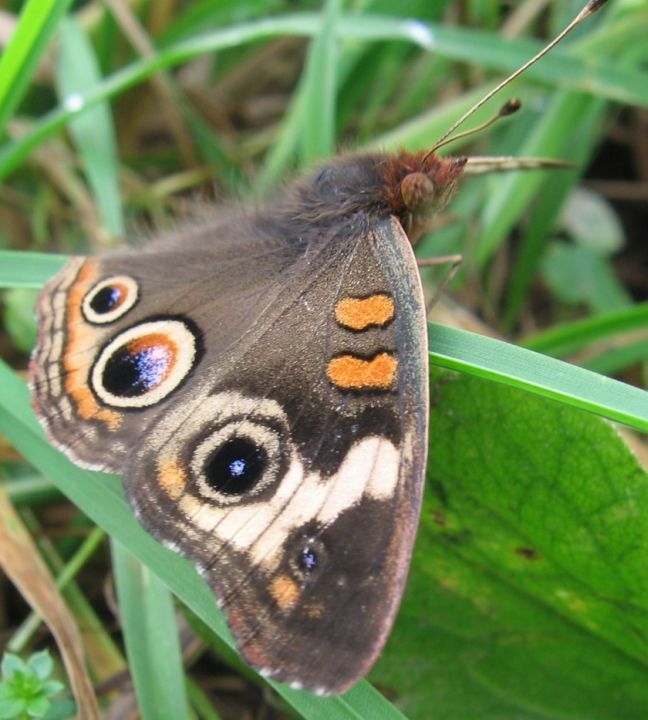 This year, Conrad and other butterfly observers have seen unusual numbers of this beauty in the County. I felt very privileged to stumble upon this one, obviously freshly emerged (no sign of wear, whatsoever), and too cold to fly away when I came close with the camera… Will it be able to make it back south for over-wintering??? 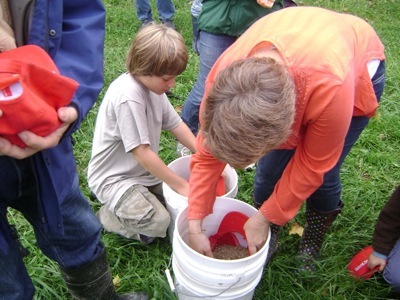 Sowing the Future and Fall Colors! 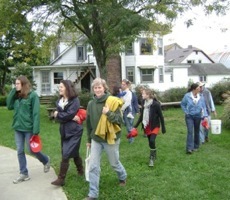 The third annual Sowing the Future event took place Saturday, October 1st at Hawthorne Valley Farm. 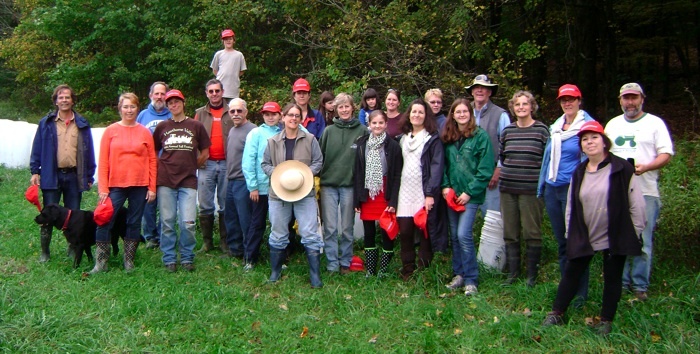 This year, a group of volunteers hand-sowed Young’s Field (off of Harlemville Road) with rye. 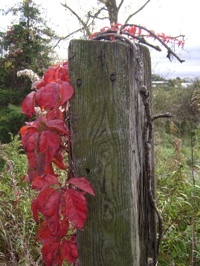 Meanwhile, as if overnight, the fall colors emerged brilliantly over the Columbus Day weekend at Hawthorne Valley. 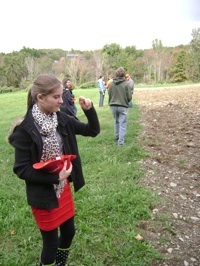 Below you’ll find scenes from Sowing the Future, as well as some glimpses of fall colors on the farm. 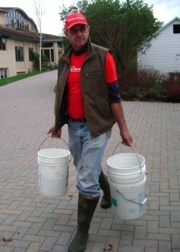 Steffen, the Farm Manager at Hawthorne Valley, leads the way carrying buckets of grain to Young's Field (right) and welcomes sowers to the field as he shows them how to cast the grain (above). 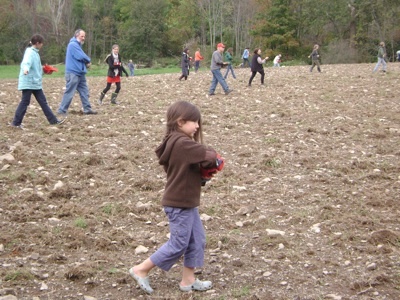 After gathering to talk about the purpose and context of Sowing the Future, sowers head to the field (above). Below, the sowers fill their hats with grain. As one sower commented, how often, in this mechanized age, does one get to hold handfuls of grain? The red Sowing the Future hats and t-shirts you see in these pictures were provided by the Sowing the Future organization in Switzerland. 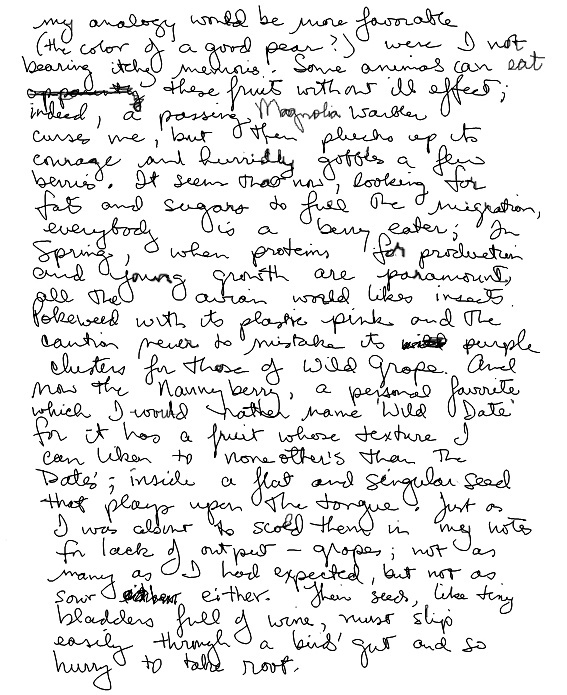 AND FINALLY – THE SOWING! 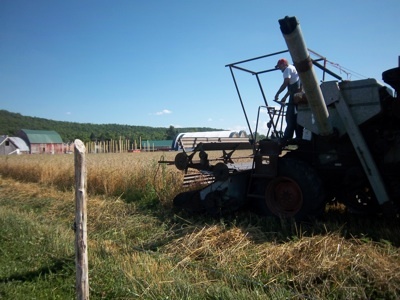 This year Hawthorne Valley planted 2 acres of rye and 4 acres of wheat – all designated for human consumption through the Hawthorne Valley bakery and store. This represents a large expansion over last year’s acre or so of wheat! 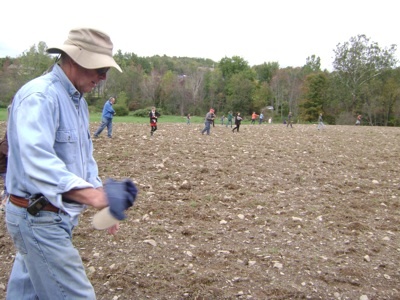 Due to the wet conditions, the sowers only seeded rye, while the wheat and remaining rye was seeded by a drill a week or so later when better conditions prevailed. SO WHAT MIGHT THE FUTURE BRING? One of the aspects of grain that makes it so useful for food production, is that a single grain when sown can multiply many times over. This year at Hawthorne Valley a total of 950 pounds of wheat and rye were sown, and we can hope for a harvest of as much as 26,000 pounds (or close to 2 tons/acre) next July, though anything over 1 ton/acre would be very acceptable. So what does that mean in terms of the goal of supplying Hawthorne Valley flour to the Hawthorne Valley Bakery? 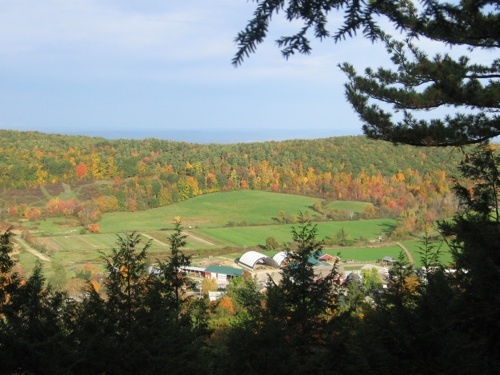 The bakery currently buys in around 60 tons of grain a year, which means that under the best of conditions (with yields of 2 tons/acre), Hawthorne Valley would need to have around 30 acres of grain land to meet that need. Hawthorne Valley is hoping to continue to expand grain production in the coming years to around 10-15 acres, with hopes of ultimately growing 30-40 acres of grain to supply the grain needs of the bakery. 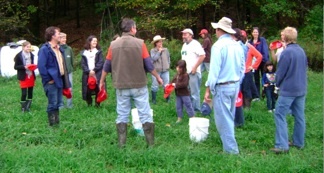 For more on growing grain at Hawthorne Valley, visit the Hawthorne Valley Farm website: http://hawthornevalleyfarm.org/growing-grain. KEEP AN EYE ON THAT GRAIN AND LOOK FOR THE HARVESTED WHEAT! 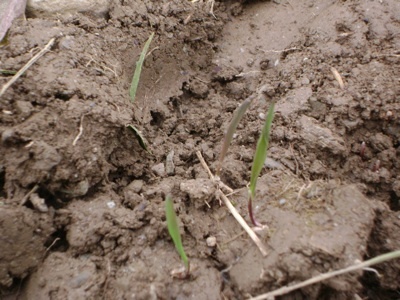 The rye and wheat seeds that were sown are germinating right now. As you can see above, little green shoots are starting to emerge, and within two weeks Young’s Field should be covered in green. Feel free to visit Young’s Field (down County Route 21C off of Harlemville Road) to check it out. Meanwhile the wheat that was sown last fall was harvested this past July (see below) and is now available in the bulk bin at the store. It will also soon by featured in whole wheat muffins made by the bakery. The fall colors came swiftly this past week, so Claudia and I set out to capture a few of the colors around the farm before they were gone. A rim of colors on West Hill. Note the prominent "browse line" where the trees meet the pasture. 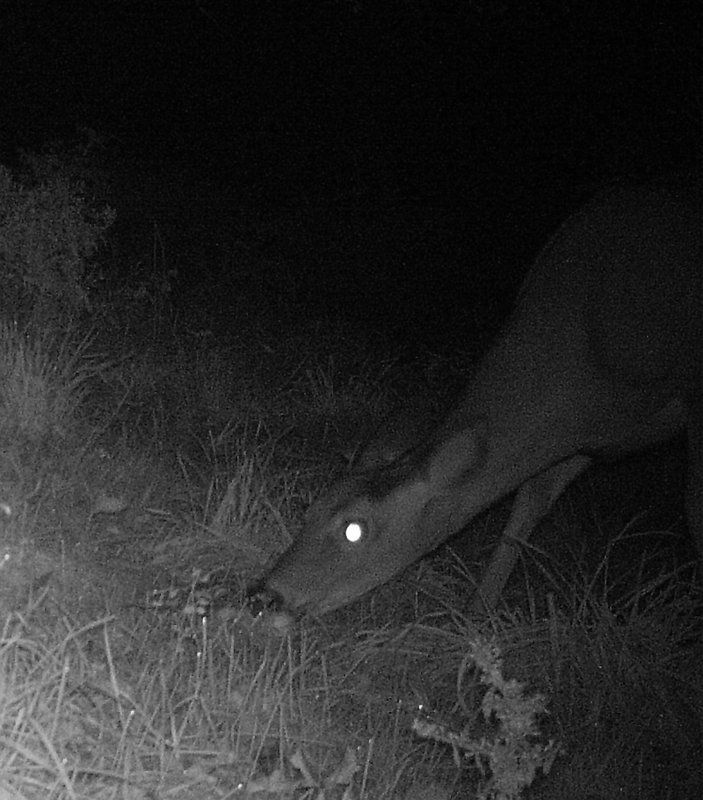 Our wildlife camera under the apple tree documented a steady stream of deer. 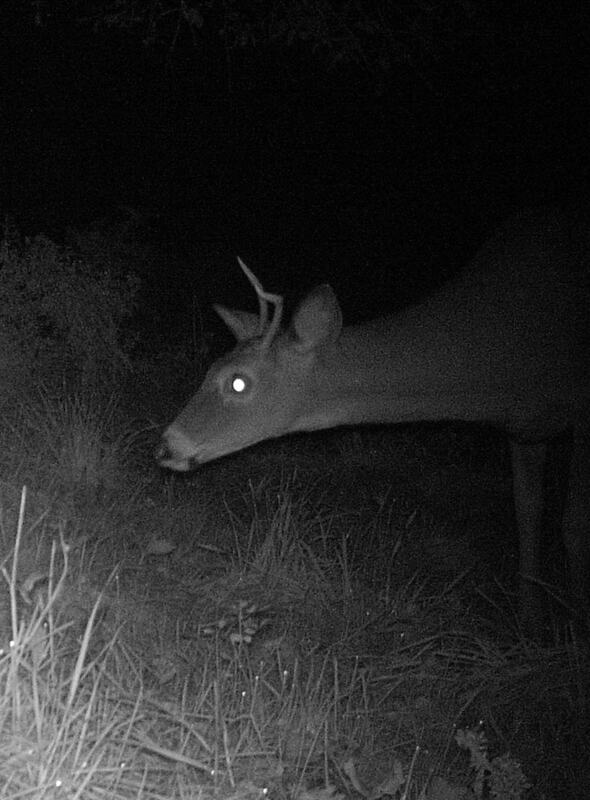 This spike buck also came to visit. 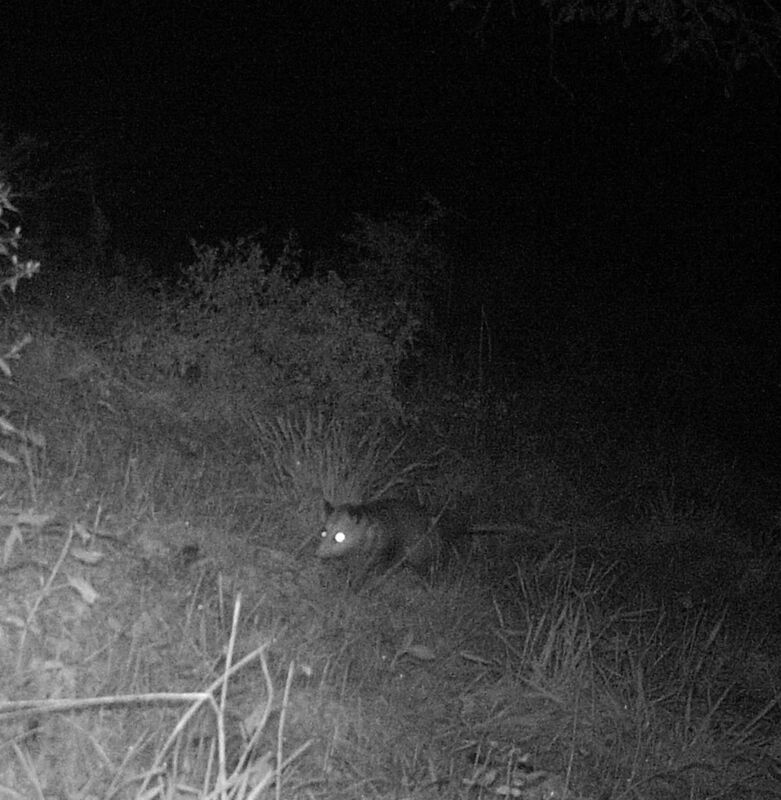 And even an opossum. 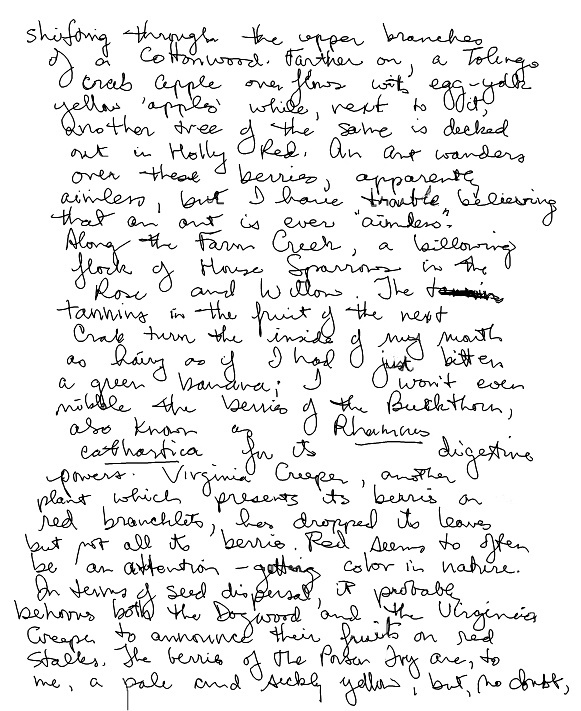 Although we have no pictures of an apple in its mouth, omnivores that they are, apples are likely part of their diets. 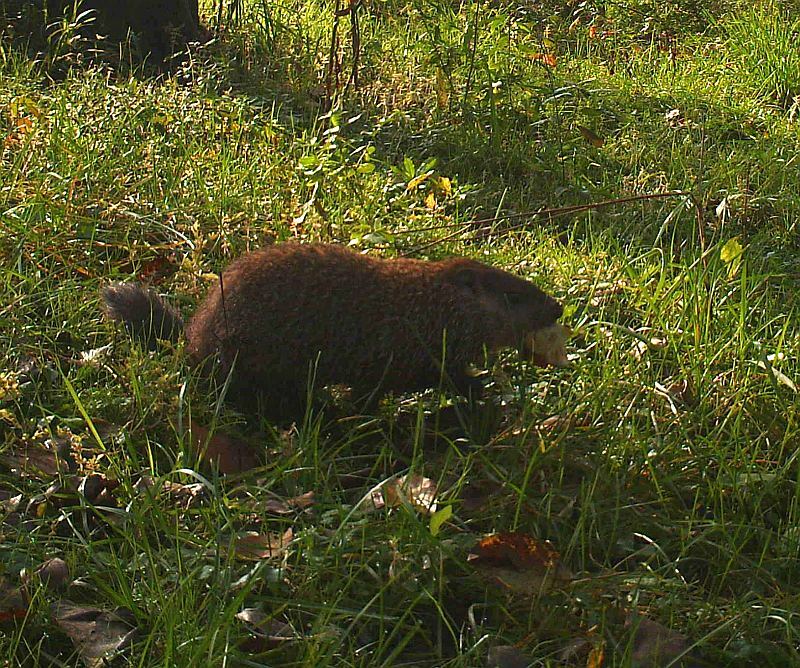 This guy (a groundhog) was, however, caught in the act. 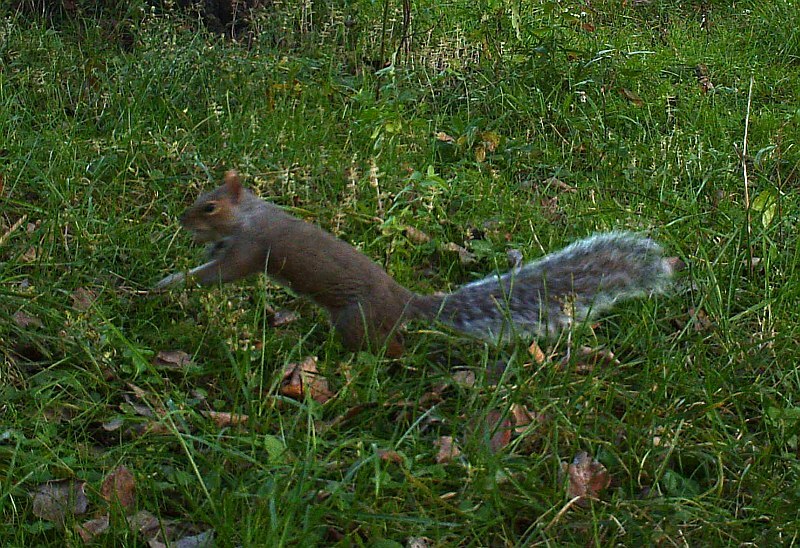 Finally, the camera picked up this Grey Squirrel. While (dancing) squirrels are better known for eating nuts; there's no reason they'll pass up a good apple snack. Granted, burying them would be futile, at least in the short term. 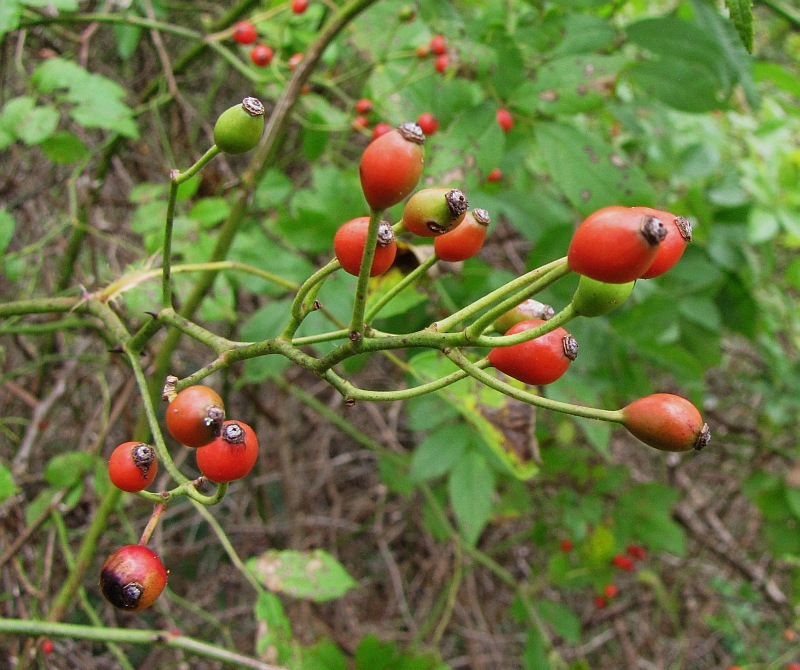 Rose hips are apparently not a fat-rich fruit, and so may not be the first choice of passing migratory song birds. However, during winter, we have found many an abandoned bird nest filled with hips whose seeds were dissected and devoured by mice. 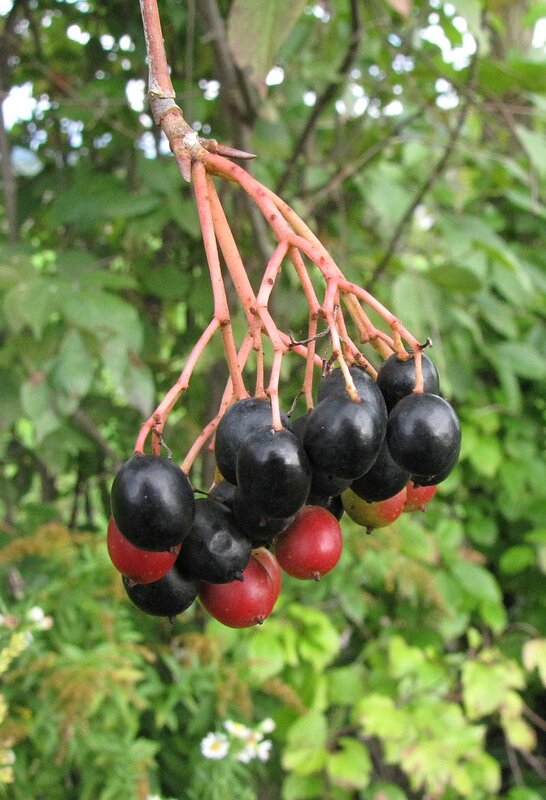 Dogwood berries, on the other hand, are fattier and more favored. 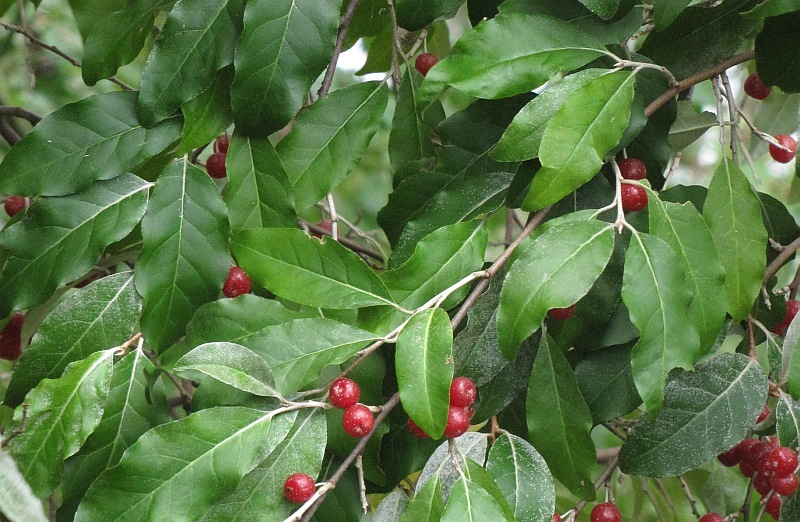 By this time of year, their berries are nearly gone. 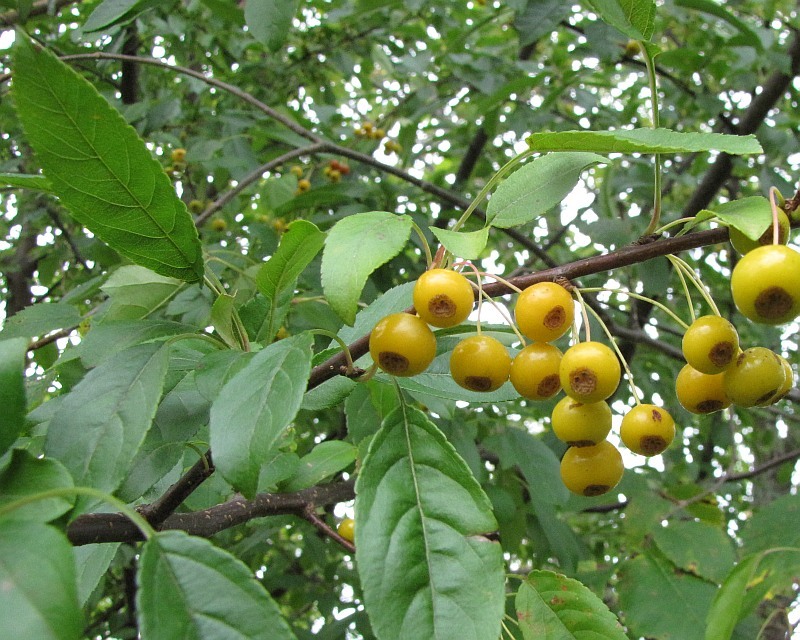 Autumn Olive, a non-native like the Multiflora Rose, has little fat in its berries. They are fine for making fruit leather; not so tempting to the birds. 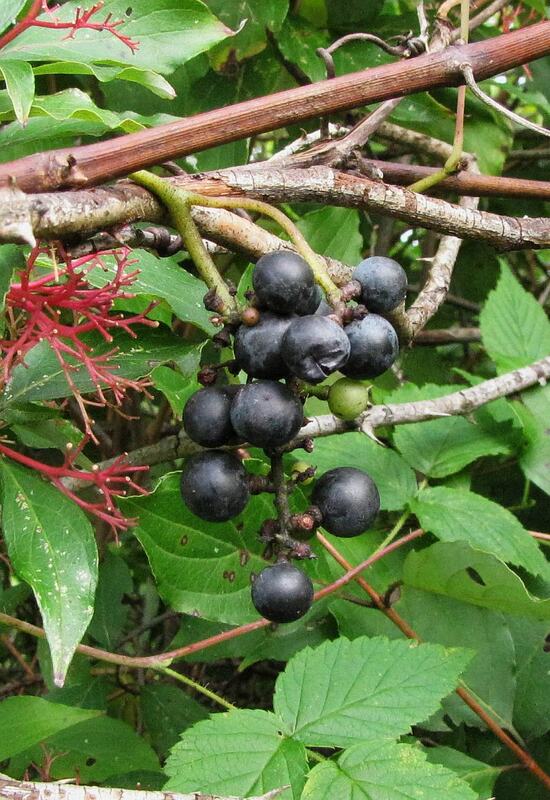 here in red) is another sugar-rich, fat-poor food, given its fruity taste and the disinterest the birds seem to show. 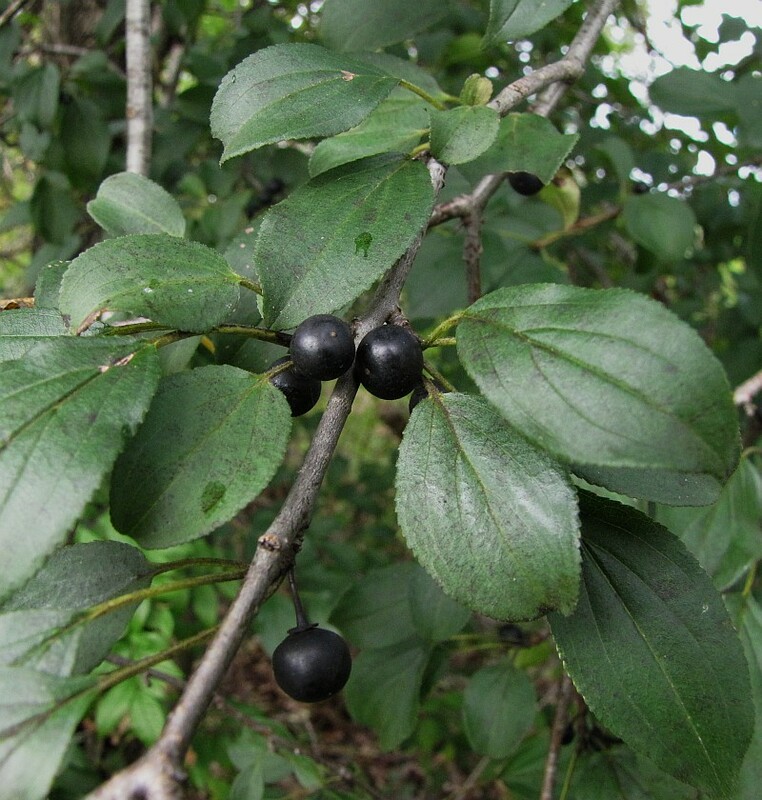 The berries of European Buckthorn are, reportedly, dramatically cathartic - cleaning out our digestive systems; coincidentally or not, the berries seem to persist well into the winter. 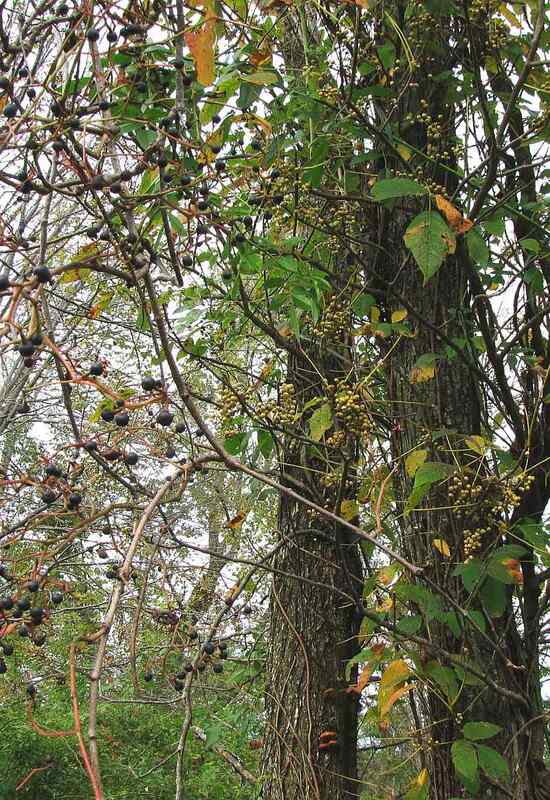 Virginia Creeper (dark berries) and Poison Ivy (lighter berries) are apparently two more tempting bird berries. The warblers I was watching were busy eating from this tangle. 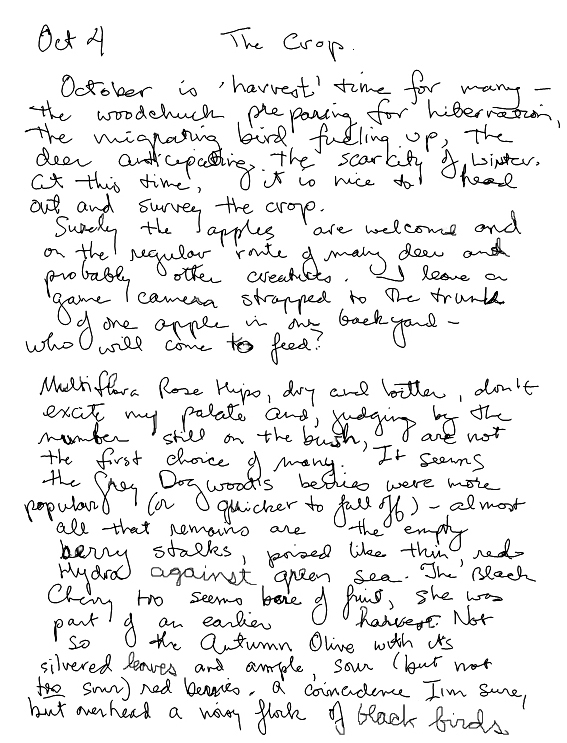 Birds, apparently, do not react to Poison Ivy oils in the same way as many of us do. 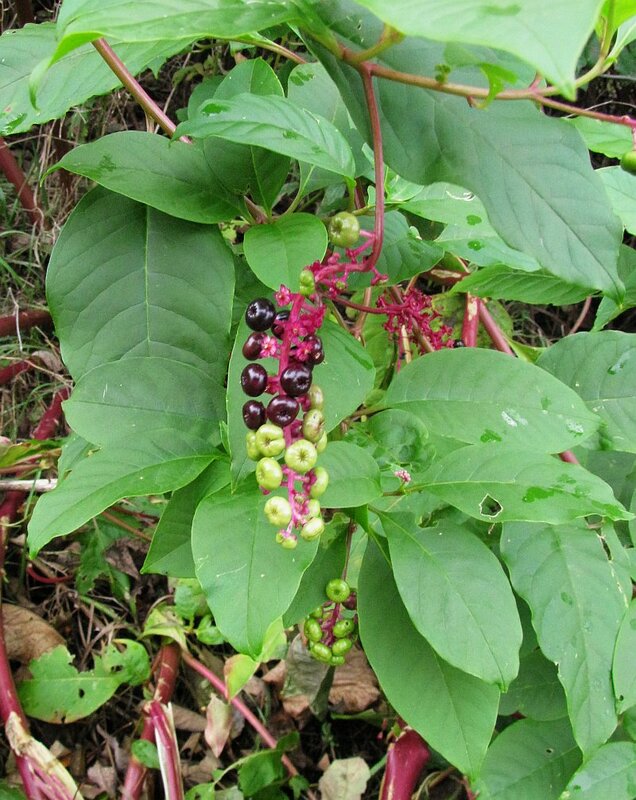 Pokeweed (which Claudia also photographed last time) is another berry that's poisonous for us, but not necessarily for all wildlife. 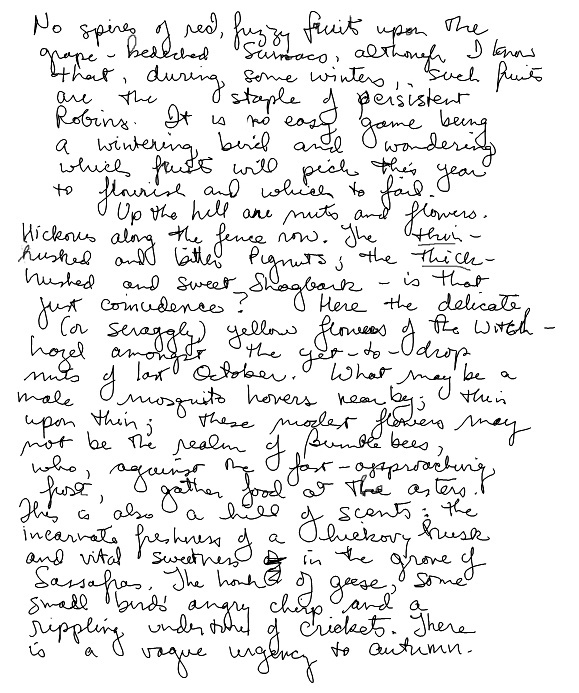 However, like Rose and Autumn Olive, it is low in fat and not a migrant bird's cup o' tea. 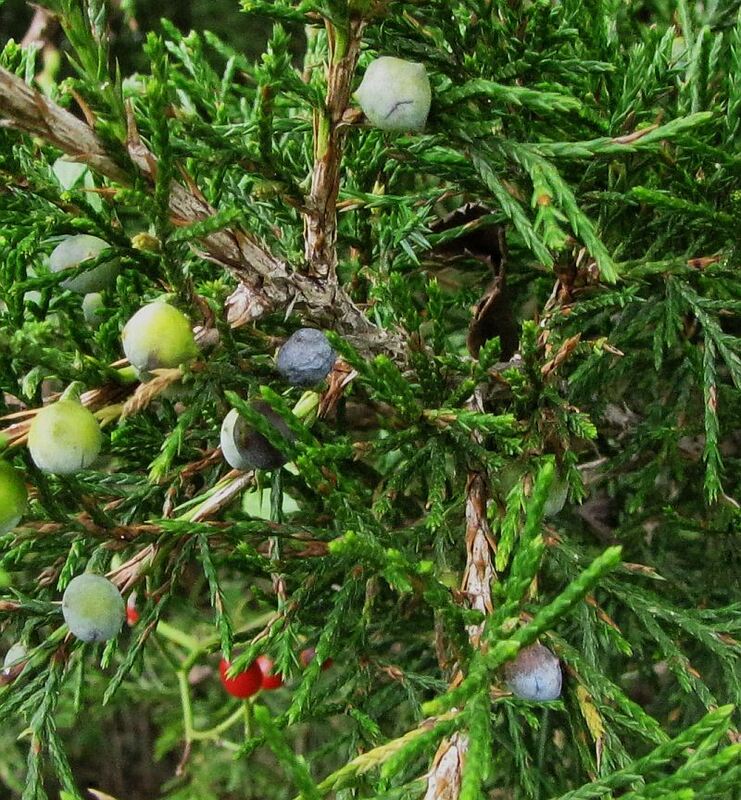 We don't often think of it, but Red Cedar is a berry producer too. I find the Nannyberry to be a tasty fruit, but your mouth will soon tell you that it is not the sugar candy of some other berries. 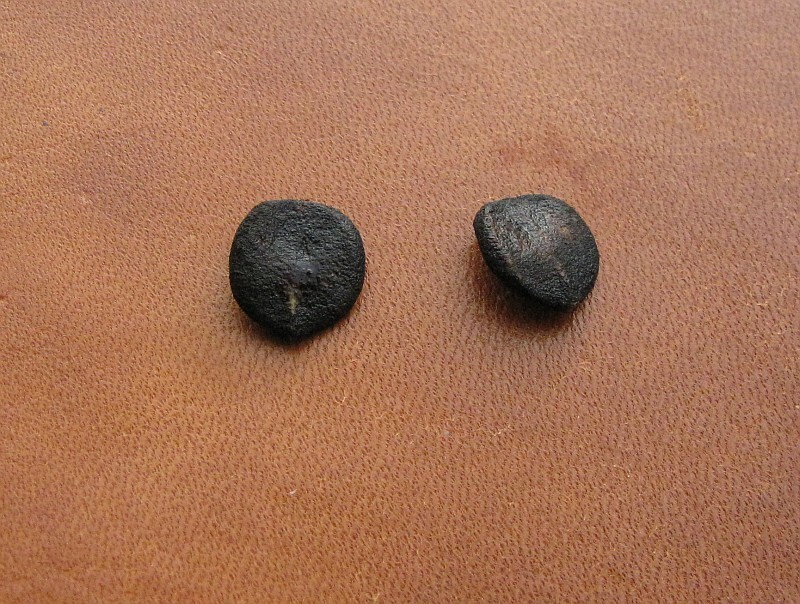 There is one flat seed per Nannyberry berry; the 'why' of seed shape seems to be an interesting evolutionary mystery. 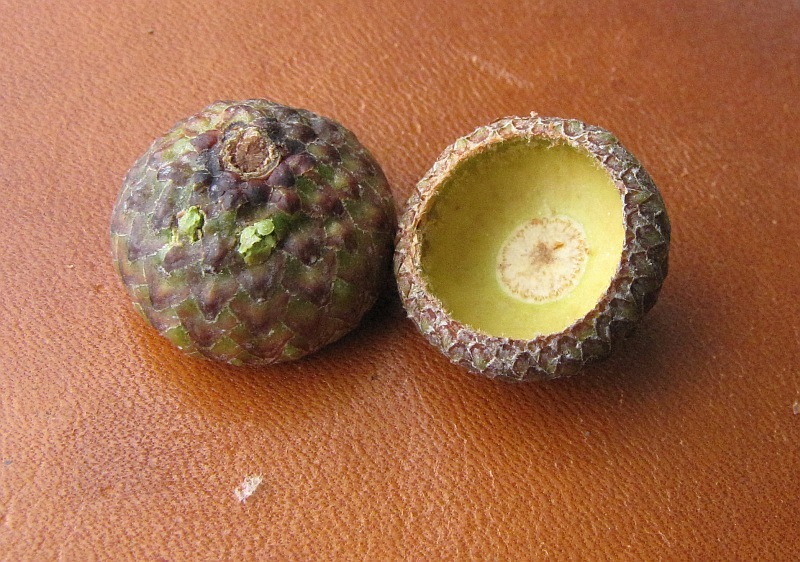 more globular seeds in each fruit. 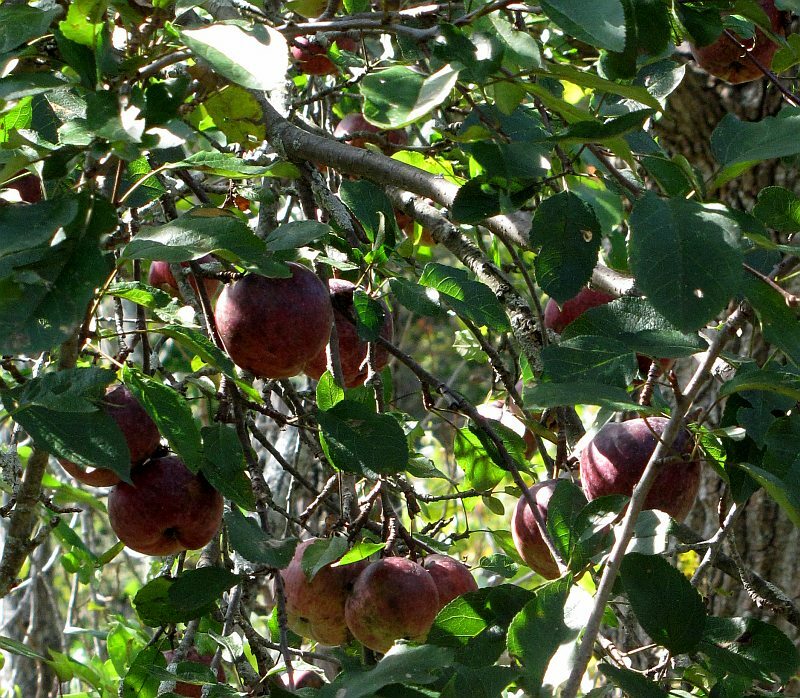 Following an older hedgerow, I get to the Hickories. 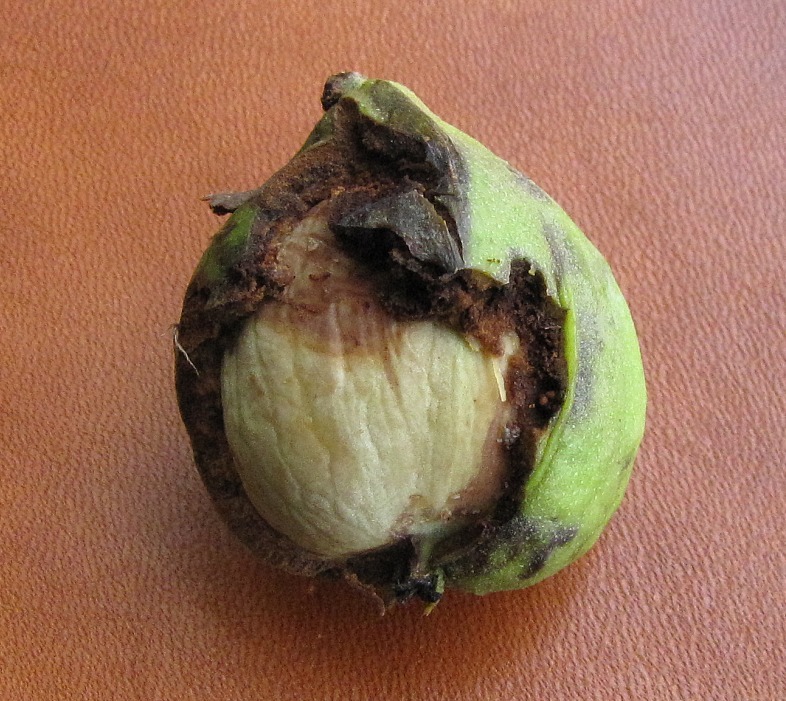 This Pignut was half-skinned by a squirrel. If you ever nibble one of these, be ready for the bitter tannins. These thick, easily-peeling husks are from Shagbark Hickory, a much more delectable nut for us, and probably for the squirrels as well. Acorns also come in bitter and sweet models. These cups are from an oak in the Red Oak group, the usually bitter side of the family. White Oaks, on the other hand, have nuts that are easier to stomach. 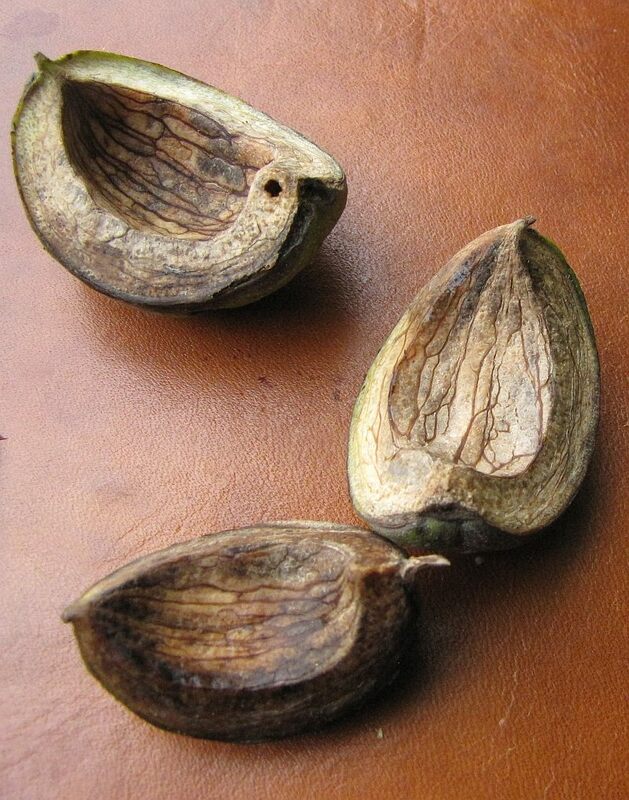 Nonetheless, those little notches in the seed cap and the absence of the acorn itself suggest that a squirrel probably picked up the acorn and had it for lunch, although, perhaps, it was just preparing its harvest for burial. 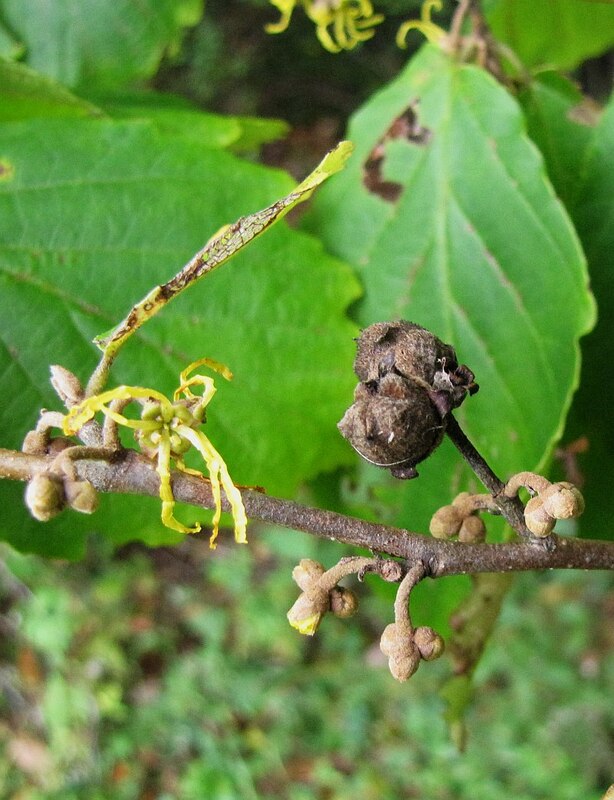 The Witchhazel is flowering, while still holding on to last years nuts. The Bumblebees were out, but they seemed more interested in the Asters. 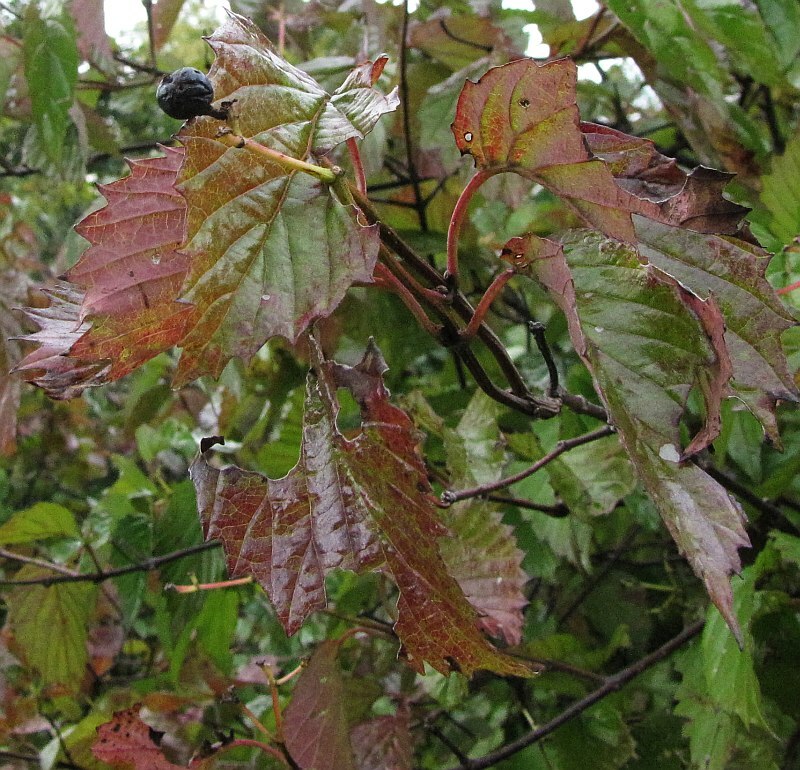 The arrowwood is a Viburnum, like the Nannyberry, but this one, at least, had already lost most of its berries. 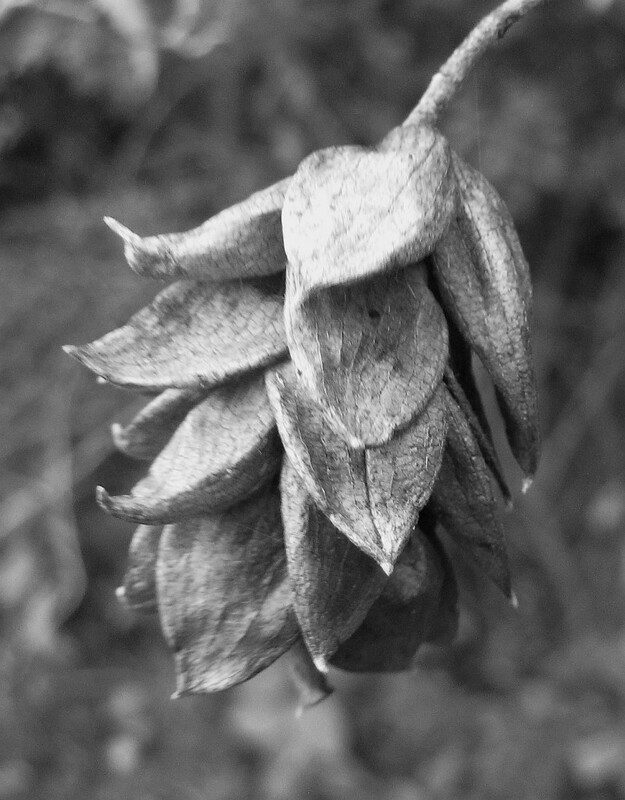 One last 'fruit' of autumn - a Hop Hornbeam seed cluster at its hops-like best.